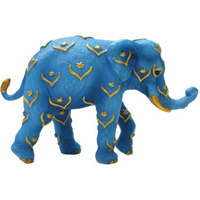 Blue and Gold Mini Statue | Tusk Elephants Figurines | One Price Low Flat Shipping! From the Westland Giftware Tusk Elephant Collection, Blue and Gold Mini elephant figurine. Measure 2.5" tall. Made of hand-painted resin. Packaged in styrofoam packaging. This delicate finely crafted miniature elephant is painted a beautiful blue with gold accents. Exquisite detail brings the most admirable qualities of the majestic elephant to life in this creative figurine! Link the trunks and tails of the Tusk elephants together to create an elephant parade.